I’ve already got one of my son’s Christmas presents picked out: the Micro UFO Quadcopter. But the truth is the copter isn’t just for him. It’s for me, too. In my 14 months here at MAKE it’s been exciting to watch drones, er, take off. But I’ve yet to put my hands on one. And I know enough about piloting a drone that it makes sense to start slow before trying to launch something fancy. The Micro UFO is a good place to start for newbies like me and my son (the product says it’s for ages 14+ and my son is 9, but I’ll make sure to keep an eye on things). It’s an RC quadcopter, not a drone and therefore not capable of autonomous flight. And even though it’s an entry-level unit, this quad is no slouch. 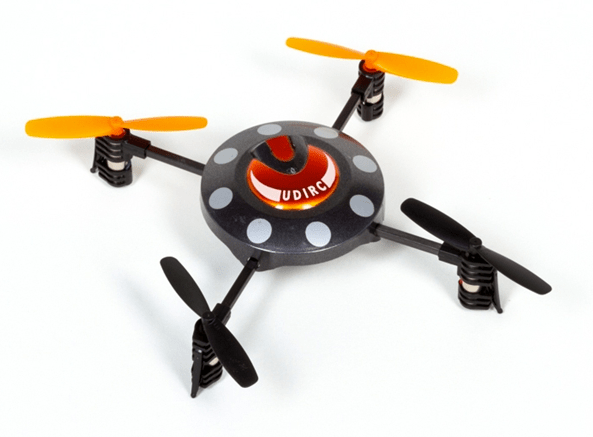 The UFO quad has controls that are very similar to what you’d find in a full size quadcopter. It features a 4-channel 2.4ghz radio that allows it to fly indoors and out and two flying modes: one for novices and a more aggressive mode for those with flying time. Another cool feature is that by pushing a switch you can make it flip forward, backwards, left, and right. Maybe you can do that. I haven’t yet. I played around with a test model and I can tell it’s going to take a few hours to get the hang of it. (My son is a quicker learner than I am). But I can report that it withstood more than a few wall crashes and sky drops with no apparent damage. A charged battery is supposed to last about 7 minutes, but I’m not skilled enough to keep it aloft for more than a few seconds. Give me time.